Join us on Sunday, November 19th for BURLESQUE SKY BRUNCH where delicious food, great entertainment, and fabulous views meet! Enjoy your Sunday Brunch as Emcee, BRITTANY LYNN kicks things off for your afternoon. 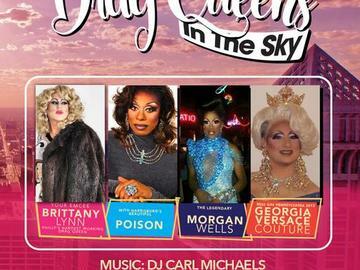 You'll be captivated by special out-of-town guests, the legendary MORGAN WELLS, Harrisburg's beautiful; POISON, and Miss Gay PA 2013, GEORGIA VERSACE COUTURE, there to charm and delight you, along with DJ CARL MICHAELS putting a great spin on your day.